A few weeks ago, the house-boy announced that he was going to change his name. This is not so drastic as it might sound to someone in the West. I sometimes find that my students turn up for class at the beginning of semester and inform me that they are now to be known as someone different. I asked one girl why, and she told me that her sister had decided it was a good idea. Tan, wanted to change his luck; and a name change will do just that. I guess it will in the West too: if your name begins with T or S, you are more likely to come at the bottom of a list than if you are called Adams, or Applethorpe. Although the bureaucratic hoop-jumping is not too hard -- it is time-consuming -- it needs a certain amount of preparation; and for this, he had to contact his family for the first time in several months. 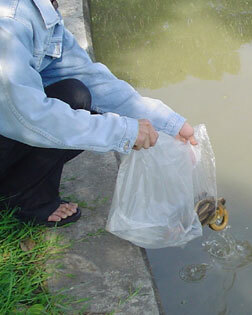 To make sure that everything went well before, during and after, he would Tamboon -- make merit -- by releasing fish into open waters. I was to be the glue holding this all together. The day had been decided on well in advance, and my involvement was to provide early morning transportation when he made merit, and the respectability escape clause (and the escape bike) when he went home. We left the house at 0800, although it had been difficult to drag him away, despite the importance of the day. The local Apple importers had lent me a new G5 for a week and it was sitting in my upstairs office. As Tan has taught himself how to use the iMac, and has played with my G4 at work, he was eager to get his hands on the G5 and put that through its paces. Nonetheless, we did get on the road and headed for the market on the Petchakasem Road that he knew had live fish for sale. Traffic was not to bad. 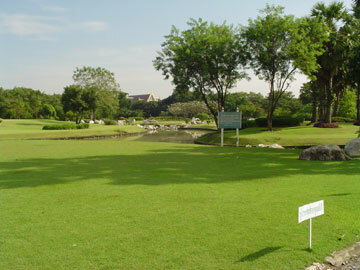 We are in the suburbs and at that time of day, traffic is going in to the city, not out. 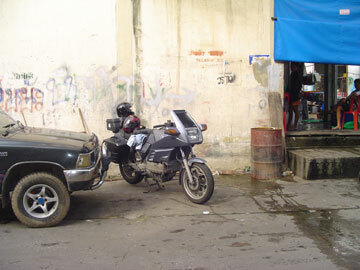 I parked the bike next to an ice shop and he checked with the people inside, to make sure it was OK to leave the bike. 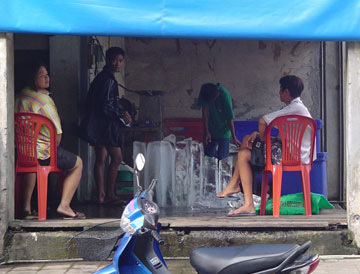 Ice shops are common in Thailand. 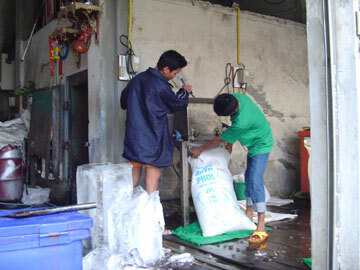 Blocks of ice from a factory are fed into machines which break it down and the crushed ice is put into sacks for delivery to shops and bars. Tourists are regaled with warnings about not drinking ice but in over 16 years I have not had a single problem that can be attributed to this. Bad squid, chicken that was off, a decidedly unclean curried catfish, some suspect roadside-bought Esaan sausage (Esaan being the local name for NE Thailand), Yes; but not the ice. This is not a product endorsement. While Tan disappeared into the market, I sat on the steps of a shop and took several pictures to the amusement of those in the ice shop, so I of course snapped them too. 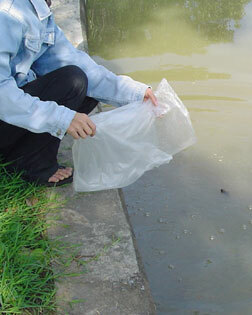 In a few minutes, he returned with a large plastic bag with about 15 or so of what looked like eels. 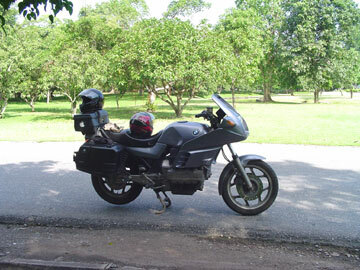 We put these in one of the K100's panniers and made for Phutthamonthon. 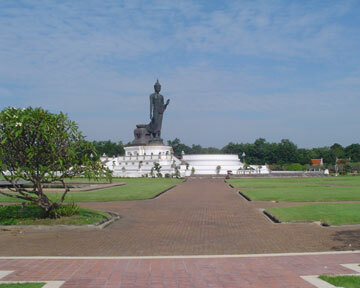 The Buddhist monument and park at Phutthamonthon is about 5 kms from my house and less than a kilometre from the university campus where I work. 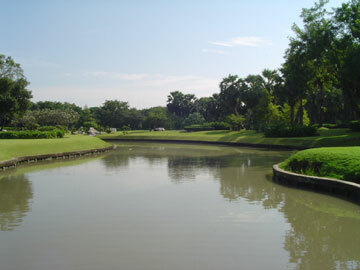 At weekends it is packed out; and each morning and evening it is fairly full of joggers, with others strolling around. I come here on occasions when it is quiet. We were riding round when suddenly Tan shouted, "Yut, yut" (Stop!). I parked the bike under a tree, opened the pannier (he commented that it was hot, and I said, "Told you so") and set off past the "Keep off the grass" signs. At the edge of the water, he knelt down and prayed to the gods for good luck and heaven knows what else. 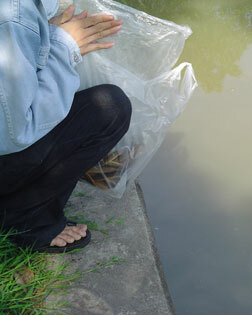 After wai-ing, he tipped the eels gently into the water and they were off. It was certainly a good day for the eels as this morning they were destined for the pot, while by lunchtime they were not only free but safe: no Thai would ever fish in such a park. 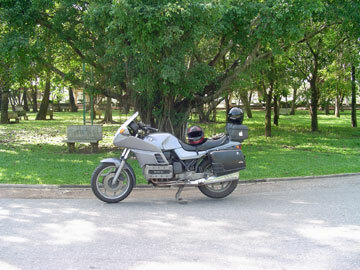 Before leaving the park, I took some pictures of the K100RS under the trees then we rode round a few of the lanes, which were almost empty. 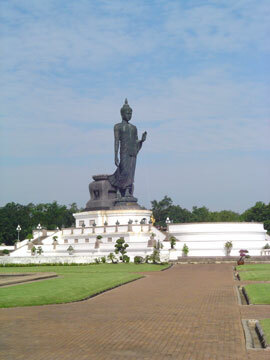 I stopped the bike in front of the statue to Buddha that is the central focus here and took a few more pictures. Duty, peace and serenity finished for now, we headed into the traffic and down the highway towards Bangkok. At the ring road I turned off and headed south, back towards the Petchakasem Road. We had looked at some maps the previous evening, and found the area of his home. Once I had navigated to the area, he could recognise the neighbourhood. The theory was ok, except that the ring road has been re-profiled somewhat and we made a wrong turn just as a truck driver was about to pull off the edge of the road. 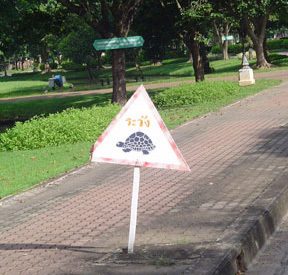 I made a signal that I needed to make a U-turn and smiled: this will get you out of many situations in Thailand. He grinned back. 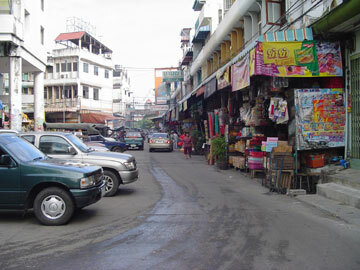 It was the next road and the soi we had to go down was only a couple of hundred metres from the highway. I was greatly amused by the reaction of a dog that was concentrating so much on avoiding an ice truck -- another area completely -- that when it regained its composure and looked ahead, it was suddenly facing a BMW. Wonderful expression on its face and a distinct jump into the air and to one side. It took me a good few minutes to regain composure myself and stop laughing. All was forgiven at the house and he picked up the papers he needed, although the name change must wait for a week or so. The offices are closed for several days due to the APEC conference being held this week in Bangkok. Nevertheless, a walk in the neighbourhood provided me with some more local flavour. 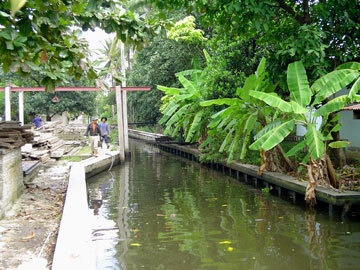 Like many of the outlying areas, the canals were there first and communities have grown round these. They are still used for communications and trade. 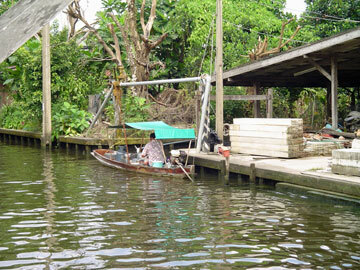 Here, there is the common sight of a noodle seller -- a symbol of good noodles in Thailand is a boat -- and a builder's yard at the side of the canal. 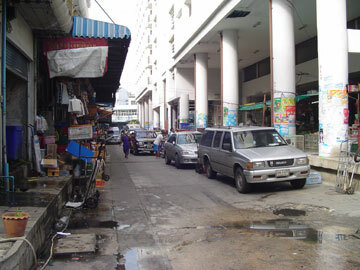 On the opposite bank, was a small shop-house that produced wax Buddhas. 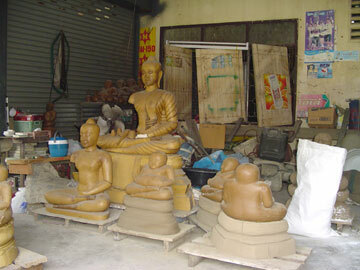 These are used to make moulds for the bronze Buddhas that are found in temples. After lunch we headed back towards my house along some back roads. Traffic was much heavier in the early afternoon than it had been in the morning and we got stuck for a while. Although the fan of the K100RS came on a couple of times, there was no repeat of the overheating light that had worried me once or twice recently. I had been taking it easy today, but I am still monitoring the problem. Maybe I should release some fish too.